It is a universally acknowledged truth that a person always needs love. The heart is a symbol of great love and eternal loyalty. Our artists are of course aware of what this means and they produce their acrylic paintings with the finest and truest devotion. A handmade canvas painting with heart pattern will fill your living room with warmth and create a welcoming atmosphere. Neither you nor your visitors will fail to see the love and attention that are hidden within every single brushstroke on the paintings that you can find on KunstLoft. Decorate your shelter, your safe haven, with motifs of love and romance that will warm your heart the moment you return home and rest your eyes on the artwork. 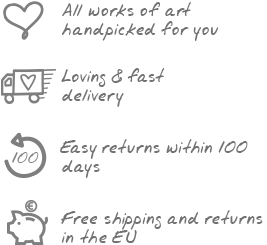 A pleasant, warm sensation will flow through your body at your first sight of these acrylic paintings with heart shapes. Delightful colours and soft contours of the heart shine in pure bliss and harmony - this is an atmosphere that you would enjoy in your workplace too. Heart motifs make great decorations for your doctor’s office, since you can transform the waiting room into a place where your patients can sit back, relax and enjoy the tender feelings evoked by the artworks. It is highly important to offer a sense of care and protection, since a clinic’s operation is founded on relationships of trust. Though, you can also create a welcoming atmosphere whilst opting for a subtler motif: why not choose a handmade oil painting that portrays the city of love, Paris? Your home, your choice - it is entirely up to you, because at KunstLoft you will always find exactly what you need! The heart: a symbol of true love and eternal fidelity. Artists are well aware of these meanings and complete their works of art in acrylic paintings with passionate devotion. Loving energy emanates from the heart of the handmade canvas painting into your living room and welcomes your visitors with a warm embrace.